Today we added shares to fwlt on the new contract awarded. We also added to trn, and vmw. The dollar pattern we have been pounding the table on (see: “markets on the cusp” article) finally broke down. That is bullish for stocks, especially internationally exposed companies. Transports still look good as well as semi’s. The vix finally bounced (healthy), and the S&P 500- as well as most other stocks, is on the 20 day. Bullish for stocks, again. But, since we are at 3 year highs (at the top essentially), combined with a new dreary jobless claims report, maybe the market could be in for a bit longer of a correction. It never looks right when it is actually time to buy folks. It seems strange when you pull the trigger in a sea of red. But you must be prudent. We have stops in place if these support areas do not hold. By the way, we haven’t done much in the way of updating lately because there has been nothing to update. Cheers! 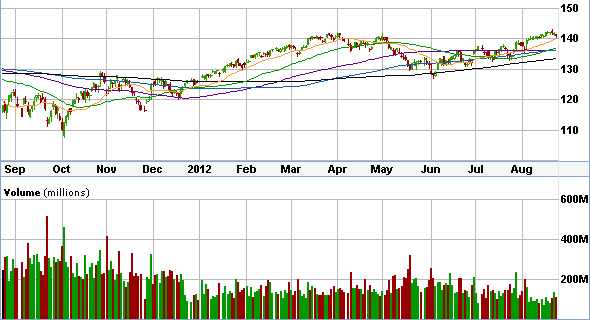 The market overall (above) has pulled back to the 20 day (orange line). That is a good short term support area. Combine that with the fact that other individual stocks are on support as well, (either on the 20, 50, or 200) indicates a strong market. Foster Wheeler AG (Nasdaq: FWLT) announced today that a subsidiary of its Global Engineering and Construction Group has been awarded a contract by Petroleo Brasileiro S.A. (Petrobras) for a world-scale grassroots gas-to-chemicals complex in Linhares, Espirito Santo State, southeast Brazil, called Complexo Gas-Quimico UFN-IV. Foster Wheeler will provide basic engineering design (BED), front-end engineering design (FEED), and technical assistance and training during the engineering, procurement, construction (EPC) phase through to successful completion of the plant performances tests. The Foster Wheeler contract value was not disclosed. The BED and FEED will be included in the company’s third-quarter 2012 bookings. The provision of technical assistance and training will be booked at a later date, after the FEED is complete, when Petrobras advises that it is proceeding with the EPC phase of the project. The complex is expected to produce in excess of one million tonnes per annum (TPA) of ammonia and urea fertilizers, methanol, acetic acid, plus formic acid and melamine, helping to reduce Brazil’s imports of these products. “Our proven experience in executing large, complex integrated chemicals projects and our ability to support Petrobras through to start-up of this world-scale facility were key to our success in winning this important contract,” said Umberto della Sala, Chief Operating Officer, Foster Wheeler AG. Foster Wheeler AG is a global engineering and construction company and power equipment supplier delivering technically advanced, reliable facilities and equipment. The company employs approximately 12,000 talented professionals with specialized expertise dedicated to serving its clients through one of its two primary business groups. The company’s Global Engineering and Construction Group designs and constructs leading-edge processing facilities for the upstream oil and gas, LNG and gas-to-liquids, refining, chemicals and petrochemicals, power, mining and metals, environmental, pharmaceuticals, biotechnology and healthcare industries. The company’s Global Power Group is a world leader in combustion and steam generation technology that designs, manufactures and erects steam generating and auxiliary equipment for power stations and industrial facilities and also provides a wide range of aftermarket services. The company is based in Zug, Switzerland, and its operational headquarters office is in Geneva, Switzerland. For more information about Foster Wheeler, please visit our Web site at www.fwc.com.